The Crossing – Grab a cuppa, tell a story or listen to one. After staying a while in the US, the author returned to India, the country he was born, raised and spent his formative years. As it happens, something he was so accustomed to suddenly felt new and needed practice. “Welcome sir”, the man in crisp navy blue security uniform said cheerfully giving me a polite bow. He then proceeded to give me a brisk but thorough body frisk with a portable metal detector that would put any American Airport TSA personnel to shame. Before I realized what happened, the man had done his job. He gave me a polite bow again and opened the door of the hotel as I looked at him bleary eyed and disoriented after my transcontinental flight. The multistoried hotel was located just across the largest technology park in Hyderabad. I looked out of my room window at the rows of huge buildings across an empty road. It was late in the night but most of the buildings across the road were lit up, their glass edifice shimmering brightly against the night sky. “The hotel is just across the road from the office park , the HR manager had chirped cheerfully over the phone, ” it is verry convenient” she had said rolling the r’s in a fashionable south Indian accent. “We also arranged for an office drop, it will take you right upto the office building. It is a big campus – too many buildings, the cab will be verrry convenient” , the r’s rolled again to convey the emphatic message. Looking across the road I wondered which of the buildings hosted our office.”If it is just across the road , I can perhaps just walk to the office” , I thought before dozing off to sleep. “The cab is ready sir !”, the cheerful receptionist greeted me. The security guard, who had given me a body frisk last night, approached me with a polite bow and placed my rollon laptop bag in the cab. “I will just walk”, I had changed my mind. The cab driver and security guard nodded their head in unison and stood still, waiting for me to make my next move. I want to leave my laptop bag in my room” , I said politely. The security guard retrieved the bag from the cab and handed it over to me before I could blink my eye. I turned back to enter the hotel lobby and lo and behold, our speedy Gonzalvis security guard was standing at the entrance with his portable metal detector ! No one could enter the hotel lobby until his work was done. A polite bow, a blurry flash of the detector across my body, another polite bow and I was in the hotel lobby. I left the bag in my room and returned back, clutching my iPad, scurried past my speedy frisker, into the walkway leading to the road that separated me from my destination. It had rained last night and I walked carefully avoiding the puddles and stood next to the zebra crossing, when a blast of horn drew my attention. The road was swarming with vehicles that would speed up just before they approached the zebra crossing. It was a Serengeti stampede ! Endless rows of vehicles of all shapes and sizes ran across the road. The elephantine bus swaggered as it ran towards the crossing as the warthog autorickshaw wound it’s way through the swarm of wilder beast cars. Motorcycles jumped through the stampeding vehicles like gazelles, only pausing to honk as they passed me. “Look at that silly man !” the striped gazelle honked teasingly to the brown wilder beast, which honked in agreement as it swerved toward the elephant. 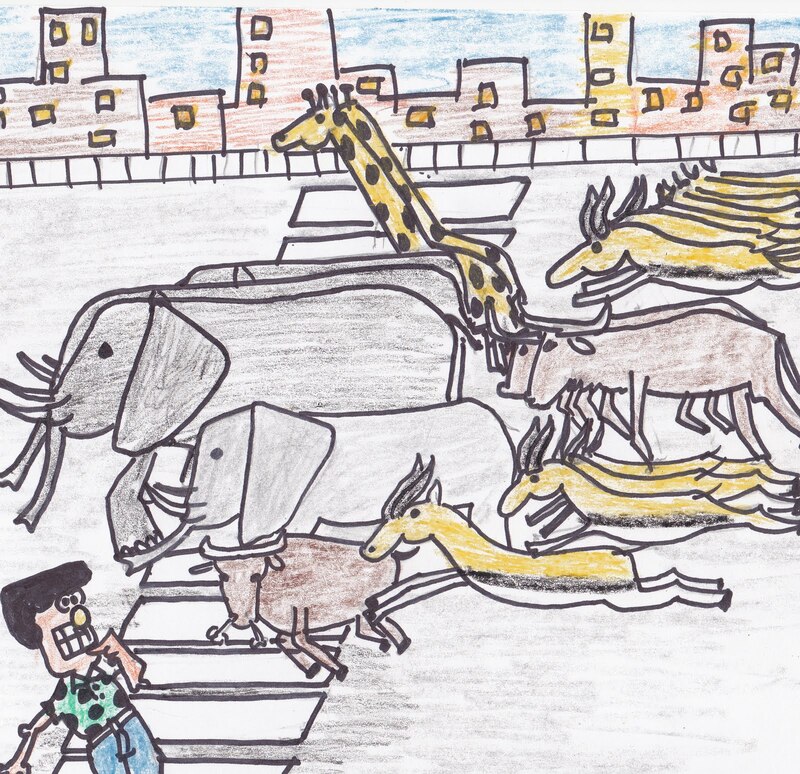 “Ooooout of my wayyyy !” A long blast from the huge elephant cautioned the swarm of gazelles that overtook it in an attempt to have a closer look at the silly man who stood clutching his iPad on the zebra crossing, with his eyes wide in amazement. It was a wild ! I stood on the fringe of the road for fifteen whole minutes, hoping to catch a lull in the traffic and cross over to the other side, but the endless swarm of vehicles did not stop. Not even for a second as I looked longingly at the buildings across the road. Just then a woman strode past me and hurled herself into the traffic – almost with a deliberate vengeance. I gasped as she effortlessly floated through the stampeding vehicles which screeched and screamed as they ran around her. I got occasional glimpse of her long braid between the speeding vehicles, as she floated across the road and reached the other end of the road and merged into the flow of office goers entering the office park. A flurry of emotions ran through me and I surprised myself as I started to chuckle, much to the amusement of passerby’s. “I guess I have lost practice”, I was still chuckling as I walked back into the hotel and was being frisked by my familiar security guard, third time in the day. “Can you help me cross the road?”, I asked the security guard. The chuckle had helped to keep my ego at bay. The security guard smiled shyly. “No I am serious”, I said, still unable to wipe off my grin. The guard handed over his post to a colleague and walked with me out of the hotel. I could see the traffic zipping past us slow motion as he dove right into the flow, grasping my hand in the last moment. Like little Simba guided by the Lion king through stampeding animals, he strode across the road ignoring their taunting honks. He looked at the speeding gazelle square in the eyes, stared at the elephant, raising his arm and signaling the wilder beast to slow down. Look, step, stop, look again, trot, signal, step …. We were at the median now. Turning his head to the other side, he followed the sequence again and before I knew, we were at the other side of the road. Shiny buildings stood lined up in from of me. “Thanks ! ” I smiled at speedy . “I guess I am out of practice” I added smiling sheepishly. ” Look,step, stop, signal, trot, stop …” I thought picking up my iPad. I walked out of the room as the HR Manager looked at me with a puzzled look on her face. Story Credit And Sketch Credit : Prithvi Raj Banerjee. He is a storyteller and plans to author a book some day. He is also a photographer and a cartoonist. In his blog ‘Tales from Near & Far’, he writes & illustrates stories inspired by incidences from his old and new homes, as a tribute to people who continue to make homes under new skies.